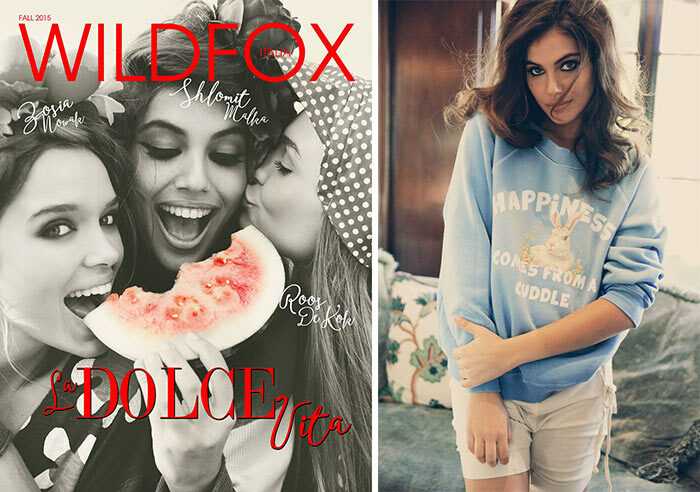 There are the three Wildfox models again! You see a trio of girls having crazy fun and you already know what brand is talking to you! Besides the first ever Wildfox perfume, the company has also unveiled their fall 2015 “La Dolce Vita’ collection along with the full package of details and inspiration about it. It’s a collection to help you enjoy a permanent vacation with no back-to-school shopping or tiring meetings. Where did the idea come from? They say summer is the vacation season, but most of us dream of a warm coastal town and a week off in winter as well. That’s the feeling Wildfox was inspired when creating the Wildfox Couture La Dolce Vita fall 2015 collection. They want you to book your unforgettable trip to one of the best Italian coastal cities, Amalfi. So, it looks like they’ve extended summer for another 3 or 4 months, which means it’s time to plan your next trip and the fashion you’ll take along. Some of the best shirts from the collection designed around punch lines or quotes saying “Talk Italian to me,’ “Italians do it better,’ and ‘Happiness comes from a cuddle’ are so adorable you can’t ignore them. Some phrases are not even translated to English and continue to keep the local vibes in place. There are also amazing floral prints for those who don’t like to talk with words. The entire Wildfox Couture La Dolce Vita collection screams comfort, pastel colors, and a calm weekend afternoon at the house. Is this the kind of Italian culture we think we know? Not sure about this, but the pieces are definitely must-haves. Your shirts should be bigger than your actual size, your pants must be soft and smooth, your hair is messy or thrown in a messy bun‚Äö√Ñ√∂‚àö√ë¬¨‚àÇ do this step by step and you’ll be a trendy Wildfox customer in your own rest-house around the beautiful landscapes of the Italian countryside. Featuring the retro hair and makeup of Bridget Bardot, the models bring back the best highlights of the Italian culture a few decades ago. The flower theme is still active, speaking the feminine side of the new collection (and that’s the bigger side). The color theme is another suggestion to that point ” the palette contains a series of reddish colors and tones (including a few variations of pink!). The pastel creams are also very vivid. All this is combined in shift dresses, tees, sweatshirts, and sweatpants. This is a casual sporty style without any famous Italian extravaganza.